The current book that I'm reading, Naturally Thin by Bethenny Frankel inspired me to make this hearty yet healthy pasta dish. 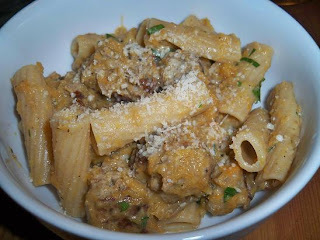 Dan and I worked on it together, as he tackled the meatballs and I made the pasta sauce. The sauce came together organically by mixing a bunch of healthy yet filling ingredients with a generous amount of good seasoning. The result was fantastic and so much more exciting than a traditional red sauce--and healthier too! Dan's Turkey meatballs, that were also mixed into the sauce were stupendous and as flavorful as his meatloaf and turkey burgers. We experimented by using whole wheat rigatoni pasta and were surprised by how tasty and virtually similar in taste it was to white pasta. The dish was a smash hit and we'll be making it again soon and experimenting more with butternut squash. See my recipe below if you're interested in trying it. *The below recipe includes ingredients and directions for the pasta sauce only. To make Dan's mini turkey meatballs, follow this recipe and instead of making a loaf, use a small spoon to separate the meat and form it into mini meatballs. Set water to boil in a large saucepan and cook pasta according to directions on the box. Sautee onions on medium heat for 5-7 minutes or until they get soft and slightly brown. Add the butternut squash, salt, pepper, Italian seasoning, nutmeg and cinnamon and stir frequently for about 7-10 minutes or until the squash gets soft. Add the chicken stock, mascarpone cheese and stir around (you'll notice that the squash will begin to break down). Using an immersion blender or a traditional blender (whatever you have handy), puree the sauce until just slightly chunky. Add meatballs into the sauce and heat through for about 5 extra minutes. Add pasta right to the sauce and stir in. If the sauce is too thick, add 1/4 cup of pasta water to thin it out. Top with fresh parsley and a small handful of parmigiano cheese (if you want). Enjoy, and I'm warning you that you might get addicted. This dish looks awesome! I am a fan of whole wheat pasta for sure. Especially with hearty sauces that work well with the earthy taste. looks yummy, I bet it would be good with pumpkin instead of the butternut squash too!